Kelso is situated in northern Tasmania and is a low-lying settlement on the northwest coast of the Tamar estuary where the mouth of the estuary meets with Bass Strait. 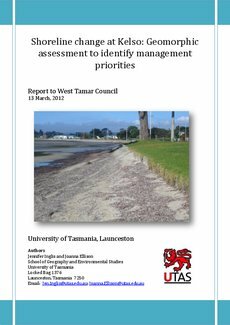 Kelso has been identified as vulnerable to future erosion with projected sea level rise (RD&M 2002a, p. Map 1; DPIPWE 2008; Sharples 2006, p. 128), and there have been reports that the Kelso shoreline has been undergoing change including coastal erosion over the last few years (Milner 2008). Sea walls and groynes have been constructed in the past to mitigate the effects of erosion, however these structures may be interfering with coastal processes. This report investigates geomorphic shoreline change and resilience at Kelso from aerial photographic evidence and ground survey, to provide recommendations for shoreline management.